While Michael was settling on a hoppy pale ale, Christian was really thinking about brewing a smoked ale. I had both of them over to talk about homebrewing and poured a couple of my own, one of which was the Smoked Scottish 2. Even though it was his first taste of a smoke flavored beer, Christian really liked it's distinguished character. That sounded good to me, cause I love smoked beers, and was itching to brew a pale/amber version. This beer was a little more complicated than the Cascade IPA. It received 5 gallons from the main mash. We also mini-mashed the smoked & dark crystal malts. I was contemplating getting this mini-mash done ahead of time, but didn't have cheese cloth until morning. So we fit it in right after pouring the mashout infusion for the main mash. The smoked mash went well with a decent conversion after about 30-45 minutes. We then sparged by pouring preheated water (in thermos & coffee carafe) over each grain sack to get another 1.75 gallons. This portion boiled on its own for about an hour, and while the color really deepened, the concentrated smoke aroma was fantastic. Also, since we couldn't clarify the smoked wort, a very dark brown foamy sediment formed in the boil (I always skim that stuff out during hot break), and you can see more of it on the kraeusen in the fermenter. Hopping this beer is dramatically different to pale ales. I used my Scottish Ale 2 and Nut Brown Ale as references. When I looked at the Hallertau hops Christian supplied, the package read a different alpha acid percent, so I quickly plugged them into the tastybrew program. Originally, I wrote in a fair amount of aroma hops, but since the smoked aromas didn't seem to be very strong, we thought it was better to take them out. This should be a nice deep colored, sweet and bitter smokey amber ale. I'm looking forward to the end result. You used some "collected yeast cake" in this brew. Is it possible to save the yeast cake for a day or so, or did you use the cake right away? Just curious as I'm thinking about doing some back to back brews and using some of the yeast cake. Jason... Good question. Thanks for commenting. It depends on timing. You can rack the fermented beer during a brewday, and then pour your new wort right into the same fermenter. But if you have a gap in the timing, where you have to rack the finished beer a day or weeks before brewing, then collect the yeast (essentially the top layer of trub, but a good amount of the whole cake will pour out too, and that's okay). Pour a little pre-boiled & cooled water onto the yeast cake to loosen, and then its poured into a sanitized mason jar. Keep the lid just loosely closed and stick it into the frig. You can then use that yeast later...probably as much as a month. 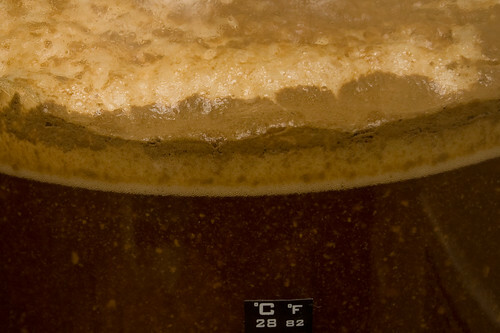 I think I may write a entry about this, and how I go about reusing yeast. All-in-all, it is well worth it, and beers fermented over yeast cakes attenuate better and tend to be cleaner in taste. I have saved multiple yeast cakes with great success. I have never been fortunate enough to brew on the same day as racking so I haven't been able to time it where I can just put a new beer right on top of the yeast cake. Anyway, the method that has worked well for me so far is to just dump the yeast cake into a sterilized glass container, I have usually stuck with flasks. Then cover the top with foil and put a rubber band around the neck to secure the foil down while still allowing CO2 to escape as needed. There should still be a bit of beer in the yeast cake and over the course of a few days, you will see it decant, where the yeast will settle to the bottom and the beer (usually about 1/2" worth) will rest on top. This will help to further protect the yeast cake. 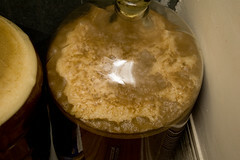 When it is time to use it, just pour off that old beer and then dump the remaining yeast into the fermenter. I have used yeast that was about 5 weeks or so old and had hyper active fermentation within hours with no off flavors in the finished product. James, this beer turned out quite nice. Since I only had a bottle of the batch, my memory of it is all I have to go with. I remember it being quite rich in flavor. The hops were kepty low as to maximize the malt characters, and that is exactly what happened. The separate mini-mash and long boil of the smoked portion worked well, and provided this fairly big 6.2% beer with just enough smoked character, and I think it played well with the higher amount of residual crystal malt sweetness. this separate boil also seemed to caramelize the smoke/crystal malts and helped provide a more rich taste (I think smoked malt in the mash of an all-grain method doesn't come out this way). I'm glad we added a very small amount of peat smoked malt, cause made the otherwise light smoked taste of German rauchmalt more complex. Overall a great beer. And I highly recommend brewing with smoked malts, cause you get a beer that is very distinguished. Blending the smoked malts worked great, and always when using peat smoked malt, use a light touch with it. Good luck, and please let me know how it turns out. Thanks for your interest. Thanks for that. I'll have to convert this to a partial mash recipe...any advice on procedure? I think I'll stay away from peat malt and just use home-smoked malts. How long before it was drinkable? James, I haven't done an extract batch in a number of years, so I'd recommend building your recipe on a software or Tastybrew.com. Start by getting the light/pale malt extract very close to the gravity point you are going for. Then make a mini-mash in a grain bag or two with the smoked, crystal and toasted malts, and basically steep it for a half hour in 155* water and strain pouring hot water through it I also squeeze the bags in the steep and straining to get out as much flavor as possible. Then add hops the way you like them. Let me know how it turns out. Ted, Just because I don't have any other form of outlet, I thought I would pass along a recent successful experiment I did. Seems you might appreciate it and give it a try given your love of smoke. It was very simple. 100% Peated Ale. I have read over and over that doing this will make an undrinkable brew - untrue. I did a triple decoction at 120 F (1/2 hr), 135 F( 1/2 hr), 154 (1 hr). Smooth, silky and peaty of course. Let me know if you would like or need more details.